Hyundai Construction Equipment Americas will feature a variety of recently upgraded models and newly available third-party attachments Jan. 22 through 25 at its World of Concrete exhibit (Booth C7027) at the Las Vegas Convention Center. The company also is displaying its Hyundai HX130LCR hydraulic excavator for the first time since the model’s recent introduction. 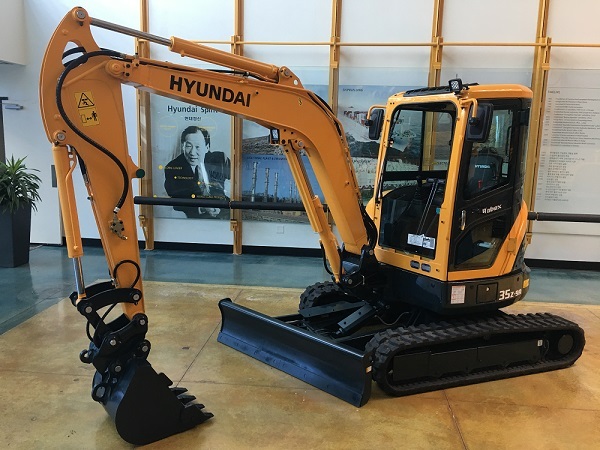 Spotlight products at the Hyundai exhibit will include the Hyundai R35Z-9A compact excavator, which is being exhibited for the first time since a recent spate of upgrades including an available four-way angle dozer blade. The 3.5-ton Hyundai R35Z-9A features a zero-tail swing design for optimal maneuverability in confined work spaces. New standard features on the R35Z-9A excavator include a Werk Brau-compatible thumb bracket, a diverter valve for easy switching between a thumb or attachment, proportional control levers with two-way piping, pin-grabber style dual-locking quick coupler and O/C piping, enhanced bucket design with lifting-eye and two-piece tooth design for easy replacement, increased curve profile on dozer blade for better grade and cutting ability, an easily replaceable cutting edge to the dozer blade, a wider opening engine compartment, and a durable centered boom LED work light for improved jobsite illumination. Hyundai also will exhibit for the first time its HX130LCR, the third compact-radius excavator model in the company’s HX series product line. The 13.5-ton machine also is available in a second standard configuration, the HX130LCRD, which includes a dozer blade. The unit displayed at World of Concrete will be outfitted with an Antraquip hydraulic cutter, designed to cut rock, concrete or asphalt for a variety of applications. The HX130LCR excavator is powered by a 73.6-hp (55-kW) Perkins 854F Tier 4 Final diesel engine. The LCR model has a standard operating weight of 29,750 lbs (13,495 kg), while the LCRD model’s standard operating weight is 31,290 lbs (14,195 kg). It achieves a maximum dig depth of 18 ft 4 in (5,570 mm) and maximum digging reach of 27 ft (8,220 mm), and provides bucket digging force of 22,860 lbf (10,369 kgf). The HL130LCR excavator is equipped with a standard 0.52-yd3 (0.40-m3) capacity, 30-in-wide (760-mm) bucket. “The Hyundai HX130LCR helps us respond to growing market demand in this weight class, especially for compact-swing machines that give contractors the added versatility of working in confined spaces,” Rogers said.